BOX HAS TEAR ON RIGHT SIDE AND TAPE MARKS. Interesting marketing concept. We DO love the original artwork on those boxes. Too bad they didn't include the Super Heroes or Monsters. We're not sure how long the promotion ran - we've actually never seen the pictures! This is original factory sealed, warping crimping exist to cardboard of box. Does present well still see photos for details. My goal is to provide you with the very best service possible. My expectation is to get the product to you promptly, safely and provide an overall happy buying experience. Vintage Official Miniatures 1967 NFL properties complete 34 figures. 2 are hand painted by mt brother years ago. Rest of figures come unpainted. Paints not included. See photos for details. Sold as is. Original box. Bright colors, some age spotting wear & tear. These are a group of all six Aurora Whoozis? model kits. Included is kit no. 201-50 Susie Whoozis, kit no. 202-50 Esmerelda Whoozis, kit no. 203-50 Denty Whoozis, kit no. 204-50 Alfalfa Whoozis, kit no. 205-50 Kitty Whoozis, and kit no. 206-50 Snuffy Whoozis. All the kits are FACTORY SEALED and in Mint Condition. The boxes are perfect and copyright date is 1966. 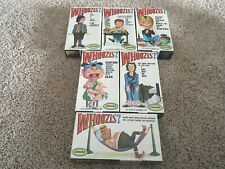 Here is your chance to get the whole series of Whoozis kits in perfect condition. I’ve seen singles on eBay before, but never have I seen all six of the kits together! GET THEM WHILE YOU CAN! Since their purchase, they have been kept in a climate controlled, smoke and pet free home. International buyers: Please ask for an invoice. The shipping might be less. From the short lived "Adventure Series". So, they reimagined it to be Harcules vs a lion! Really cool. Factory sealed! A small cello ding and another tiny spot of missing cello - for the ultra picky. This is a resin copy of The Man From Uncle Napoleon Solo’s gun for the 1/12 scale Aurora model kit. Pictured is the resin gun below the original kit part. This is only the resin gun, no other kit parts, original or resin, are included. Scarce 1960's insert - included in many of Aurora's model kits. Interesting promotional concept. Tear off one side panel off an Aurora model kit and send in money - and get things that have nothing to do with Aurora models! Kit is partially assembled. -Window and Body have been assembled/dis-assembled. -The top of the car is scratched, but may be fixable. This is an AD NOT the Attual Model Kits. It's approx. 10 1/4" x 12 3/4". This is not a reprint or photocopy. This vintage plastic model kit is complete. 1963 Aurora SILVER KNIGHT of AUGSBERG Model Kit UNOPENED NOS In good unused sealed Condition with normal wear from age. Original 1963 Aurora SILVER KNIGHT of AUGSBERG Model Kit. Has a small part on the edge that is missing 2" on plastic but can still tell that has never been out of the plastic.13" x 5 1/4" Kit No. 471-100 (please see pictures). Model is still sealed in its box and is assumed to be complete. FUN FACTS, HISTORY, ATTRIBUTES (ie size, year of production, color,scarcity, etc). Factory sealed! No cello tears. FACTORY SEALED. Expect them. We do not highlight 'typical wear' unless we feel it is out of the norm. Kit is unassembled. Engine Room Platform Small Railing Section. -R tail cove half broken into 2 pieces. Aurora Mad Alfred E Neuman Hobby Kit. Condition is New. Shipped with USPS Priority Mail. Kit still sealed in outstanding condition. This is the RARER of the two Aurora issues of the US Marine in his dress blues. The parts are in a sealed poly bag. Original instructions and decals are shown. You will also receive a set of digitally edited and color corrected reproductions of the decals [I've added a couple "bells and whistles" so you can also achieve a couple other ranks!]. This vintage plastic model kit kit includes everything shown in the listing images. Parts have not been checked against kit instructions to ensure kit is complete. Loose parts with instructions. WE DESCRIBE AS BEST WE CAN. What you see is what you are buying. Aurora Comic Scenes Lone Ranger Instruction Booklet For Kit #188 in VERY GOOD condition! BOOKLET ONLY! See scan for details! All books bagged and boarded. Good looking example of this instruction booklet only. So take a good look at the photos. These will show you its overall good original shape. As shown and found. I have several really nice antiques and toys up right now. Catalog #: 161AS05. Mold injected plastic. 1/10 Scale. Monsters In Motion. A one of a kind 1965 Aurora JFK built up model kit from the Eirk L Dorr collection who was also the curator of the Gettysburg Museum of History in Pa. estate of Ms. Evelyn Lincoln who served as JFK's personal secretary from 1953 until he was assassinated on November 22nd 1963. This is a resin cast part for the 1966 Aurora Man From U.N.C.L.E. Napoleon Solo model kit. Pictures show the resin part next to the original for comparison. Note the tree is cast solid unlike the hollow original. This is a resin cast part for the 1966 Aurora Man From U.N.C.L.E. Napoleon Solo model kit. Pictures show the resin part next to the original for comparison. No other parts are included. This is a resin copy of The Man From Uncle Napoleon Solo’s head. Pictured is the resin head next to the original kit part. This is only the resin head, assembled. No other kit parts, original or resin, are included. This is the star Trek U.S.S. Enterprise Model kit. It is sealed and has never been opened. The model kit is from the year 1995. This model is approx 1/6 scale in-between Billiken and Horizon scale models. This is the fifth kit in out ongoing line of Aurora Box Art Tribute Kits. Standard Vile & Electricity Bolt Set included. This is a wonderful model. This is a resin cast part for the Aurora Hercules and the Lion model kit. No other parts are included. Don’t see the part you need?.